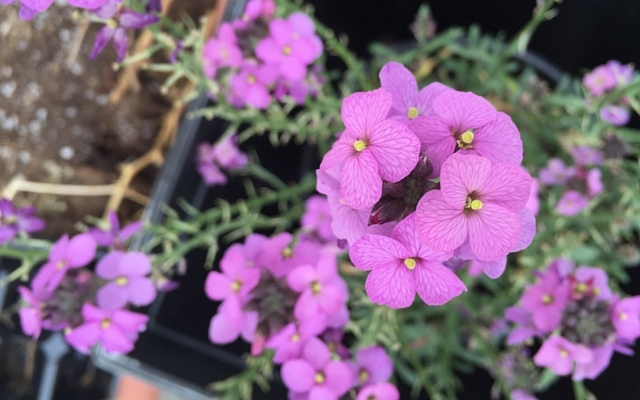 To add some variety to my patio garden this year, I chose a spring bloomer with silvery green leaves, and delicate pink flowers, called a Wallflower. I also loved the tiny intricate pattern on the petals that is only visible from close up. I had never known much about wallflowers but decided to give it a try. Most of what I was planning to grow on my patio are summer and autumn blooming so I decided to throw some spring blooming plants back there to give me some color earlier in the year. Wallflowers are fragrant and come in a variety of colors and are even suited to growing in containers, which is a must for me since I have only concrete on my patio. This post will give you the basics of how to grow one yourself. 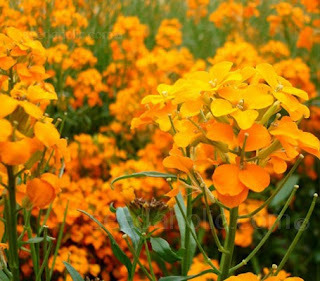 Wallflower plants have delicate small spring blooms, often in shades of yellow and orange. Newer cultivars of the wallflower plant have also been seen in pinks, purples and blues. Some have even shown to have red or chocolate colored blooms. Most wallflowers are drought tolerant. Some are perennials with short lives, while others are annuals or biennials. Perennial wallflower plants are grown as annuals in cold zones. Perennial wallflowers keep evergreen foliage in gardening zones 8 through 10, and this foliage may have a silvery hue. The kind I grew had silvery green foliage with the pink blooms. I am in zone 6 so unfortunately my foliage all fell off, nothing stays evergreen here but pine trees! If you're growing wallflowers from seed, you can sow them right into the garden or start them indoors. Wallflower seed should be planted in the spring or autumn. Cover the seeds lightly or lightly press them into moistened soil. Seeds of wallflowers need light to actually germinate. If you're transplanting from a seedling, just plant it straight into your garden soil or pot. 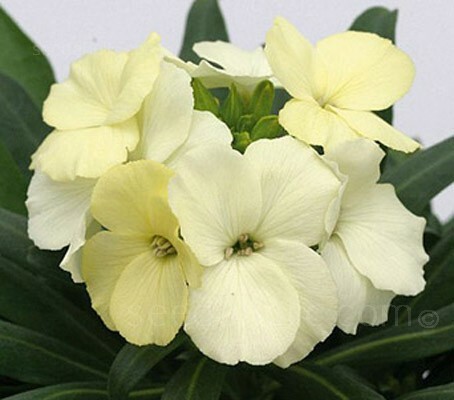 Be sure to plant wallflowers in the spring a few weeks to several weeks before your zone's last frost date. Make sure the soil drains well. Wallflower plants like sunny or only partly shady areas. I planted mine in full sun, and they bloomed freely until the heat from summer hit the patio. Wallflowers look great planted in masses with bulbs as well! Water the wallflower plants regularly until the plant seems to be established, then water occasionally if there is no rainfall. They are able to tolerate a little bit of drought, which is perfect for my hotter-than-hot patio in Utah. The summers are very dry, and we get relatively no humidity! To increase blooms, make sure to pinch back spent ones, or deadhead. 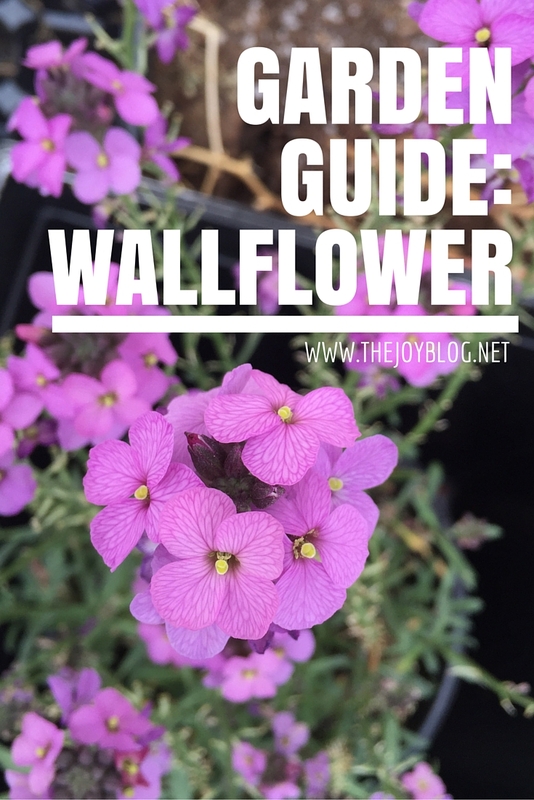 This encourages the wallflower plant to send out more blooms. If you live in a colder climate zone, make sure to provide a decent amount of mulch in the winter. This will help protect the wallflower from freezing to death and hopefully it will bloom again in the spring! Let's hope mine survives the winter this year. It's mulched with leaves, and is buried under about 5 inches of snow that has been there since before Christmas. We'll find out in a few months if it survived. I'll keep you all posted! +++ Wallflowers are relatively easy, and their small blooms are a pretty addition to any garden. Now that we've talked all about how to grow them, are you going to plant them in your garden this year?